Pics and Kicks: Go Go GO! click to enlarge if necessary. You're right Marie, I am proud. Terrific! That's wonderful that they are doing that. We need to get more hospitals and docs on board like them! I am in Georgia and am 5 1/2 months pregnant - I asked my doctor about it at my last appointment - they had a ton of information available but had not brought it up to me until I asked. I encouraged them to put some information in the waiting area. I saw on the news that there are cases of pertussis being confirmed in south Georgia now. 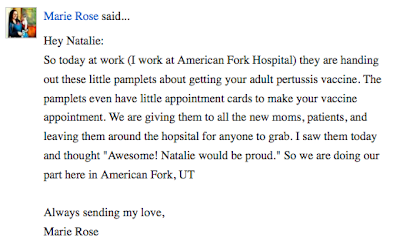 I just had my baby at American Fork Hospital last week and they offered me the vaccine. I got it thinking of you the whole time. I had been planning on getting it once my baby was born but it was so easy to just do it there and get it over with. That's great! I had a little boy last fall in Colorado and at the time the hospital told me I needed the vaccine. But on the side, the nurse advised against it. She said that as a new mom and being so tired, we were more susceptible to the side effects and that we really didn't need to feel any worse right then. So, I decided to get it later. I kick myself now and wish I could go back and tell that nurse a few things. I've since gotten my adult pertusis vaccine, but I really wish that I had just done it right at the hospital. I got my booster yesterday and thought of you (although you don't even know me). My arm hurts today, but it's a small price to play to keep our little ones healthy and safe! Try "Eat, Pray, Love" by Elizabeth Garrett. It's excellent! Love it and I can't wait for the movie to come out in August! Ok, totally random but I actually came on your blog to tell you I got my shot today and I saw this post. I had to take my daughter in to get her shots and I thought of you and asked my doc if I could maybe hurry and get this one shot. He said yes. Lets do it now. My husband was also there and he said he could get it too! Yay! I'm getting my Tdap booster tomorrow! My sister recently had a baby and I get to go visit soon so this was the perfect time. Thanks for being a voice I would never have even known about it if it weren't for you. A WebMD article from yesterday about the California epidemic. I do not intend to make you more worried or even sadder, but I want you to know so you can be as accurate as possible with the information you share. I have my vaccination appointment, and thank you! I have been following your blog for awhile now. I have been so impressed by your strength. I just gave birth to baby number three 6 days ago. I live near Washington DC. I have been getting the word out to friends and neighbors to get their shots. The day before I came home from the hospital I made sure I had mine and thought of you when I got it. Thanks for making us aware of how important it really is! I'm here in Las Vegas and they have had commercials about getting the adult vaccination. Yay!! Is it not part of the vaccination shots for babies in the US? I live in Canada, and our babies get it at 2 months, 4 months, 6 months 18 months (I think) and then the booster at 5 years old. My daughter just got her 5 year old shots on Tuesday and received the last booster for pertussis. I must admit, I too, thought of you when she received it. 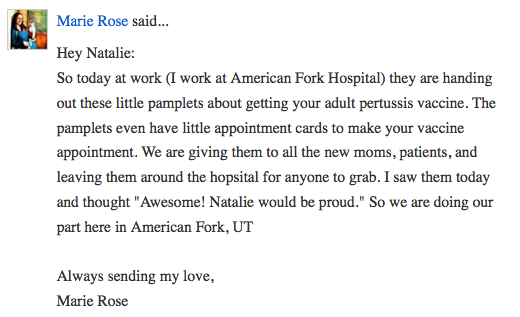 On another note...I loved the news clip that Joe Moore had about pertussis. In the story, it said that there would be another story about Gavin coming soon...are they waiting until you get home, or has it already been on? Please post the link. One of your faithful Canadian followers! My oldest just had to get a booster for that and whined all the way through until I told him your story and asked him how he would feel if something like that happened to his baby brother and he sucked it up and took it like a man. :) So proud! The other day at work someone mentioned whooping cough and I went into it all! Two of the girls I work with are moms and HAD NO IDEA at all! I was on WebMD today, and one of those random, "will you take a survey?" things popped up and it was about Pertussis and how much I (the surveyee)knew about it. Of course, I took it. I though of you. BOISE, Idaho -- Idaho health officials are warning residents that cases of whooping cough are on the rise across the state. The Idaho Department of Health and Welfare says that 77 cases of whooping cough, also called pertussis, have been reported in Idaho in the first six months of the year. That compares to 45 cases reported during the same period last year. Other states have seen an increase in the disease as well: California is dealing with a pertussis epidemic that has killed six infants so far. State epidemiologist Dr. Christine Hahn says the department is encouraging families to get vaccinated against the illness. She says infants will be better protected against potentially fatal whooping cough if adults and adolescents in their families have up-to-date vaccinations or booster shots. We will be getting ours! So proud of you Natalie. I have been so impressed by your strength.I have been getting the word out to friends and neighbors to get their shots.This site is great.